Sorry for another late report, popped over to Paris to see my sister off, who came and watched my race. The team on the day consisted of my sister, Mat Gray (a fellow Dirty Deeds racer from Melbourne), Jeroen and Tom the mechanics, Roeland was team manger and Rose was taking my jacket and pants from the start. Whilst in the team carpark, we had a few people come up and say hi, plenty of people recognised me from earlier races, and came to say hello, and there were even some Aussies from London came over to say g'day. Always nice to hear some Australian accents amongst the Flemish whilst I'm racing. It was ridiculously cold (negative something), so we spent most of the time in the car staying warm. Sure enough, 2:15pm rolled by and I started to freak out about warming up and getting my numbers pinned. This usually isn't a problem, but I think I was more nervous than I realised and I pinned my numbers so they popped out when I pulled my suit on. Only enough time for a short warm up with the Japanese guys, and then I took off to the start line. Thankfully there was a road clear where I could ride around the crowds to get to the start/finish area. The start came about quickly and in no time I was lining up watching the lights turn from red to green. The race was always going to be extremely difficult. One of the spanish guys came down hard on the tarmac at the start, but thankfully I was on the other side of the road and managed to avoid him. I moved up into a pretty decent position at one point, and was riding well, maybe around 52nd for the first part of the first lap. Exactly where I wanted to be. Throughout my numerous practice laps combined I was able to link up and ride almost all of the course, however once the gun went it was a completely different story. Unfortunately a dropped chain up the climb I was reciveing cheers on meant I had to stop and put it back on, losing all the positions I gained. I slowly managed to move back up, catching David the Norwegian, and we rode together for some of that lap. 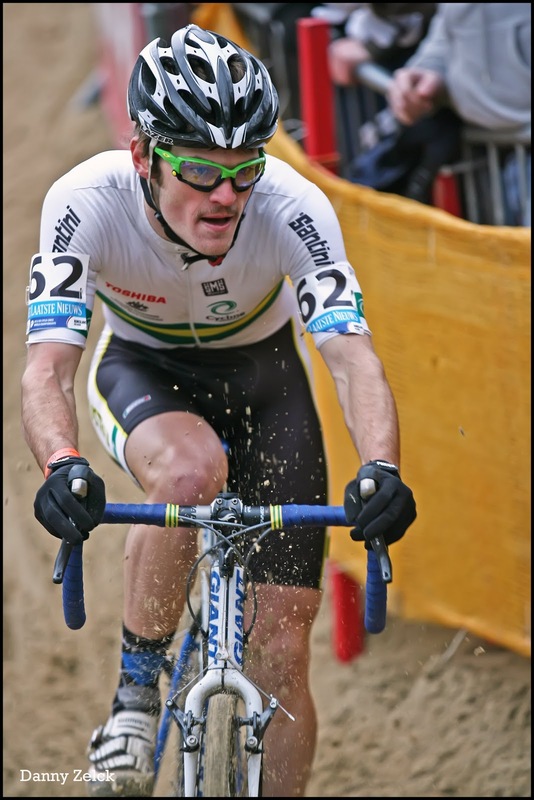 The sandy sections that I was able to ride occaisionally in practice became completely unrideable, partially due to my vision blurring from pushing way too hard, and partially from the lines all changing due to the mayham of the first lap. My dismounts were sloppy and I was an absolute mess. The running in the sand was simply destroying me, Im sure I would've hit max HR out there had I been wearing a monitor. My throat was on fire. And imagine amongst all of this, there are 61,000 people screaming and yelling as you struggle through the sand. I finally managed to compose myself somewhat, and settled back into a good rhythm. Whenever I passed the sandpit or the sandy climb, the crowd would erupt, especially if I ended up making it through smoothly. 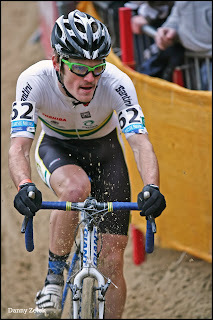 Thanks to a much cleaner second lap, I was able to catch and pass an Austrian rider, and put some time into him. I had another Austrian in sight after nearing the finish of my third lap, and I heard a roar behind me and saw something blue. There's a bloody Belgian behind me! Surely he got a flat and is just catching up! 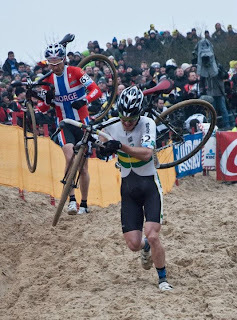 But no, it was Niels Albert and he was riding like an absolute mad man. I finished in 26 mins of riding time, -7 laps and 57th from 59 finishers. I beat two finishers, which was the initial aim. 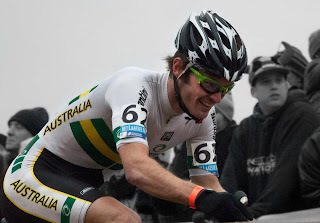 I was a little disappointed with the result, and certainly upset that I couldn't spend more time riding infront of that amazing crowd, but I would put it down to the nature of the course, as opposed to me having a poor race. Everyone looked bad on the results sheet. 24 riders finished without being lapped, and the riders I wanted to finish on the same lap as were 6 laps down. And these guys are very good riders. The exhilaration from riding in front of a crowd like that was something I'm likely to never experience again, but I will never ever forget it, such an amazing way to finish the trip. Again thanks to everyone for their support out on the course, on facebook and in the comments section on this blog. It's a great feeling knowing people are following you whilst you're racing. Thanks to my team for their help on the day, it wouldn't have been possible otherwise. 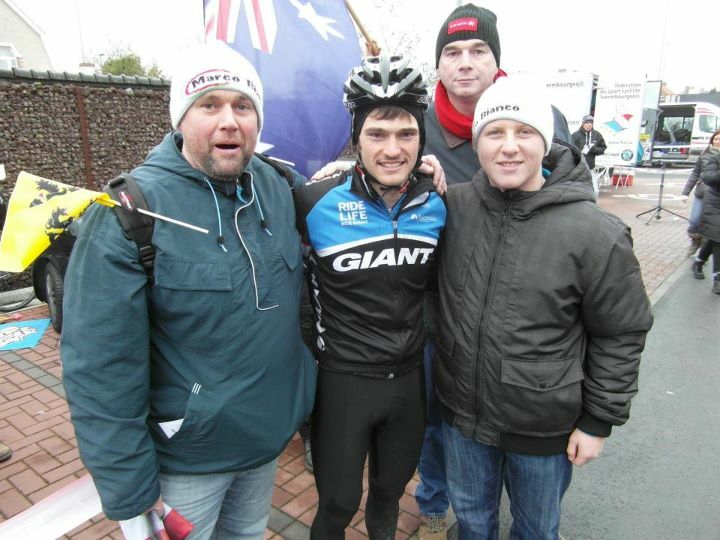 Thank you to my primary sponsor Giant Australia, and associated sponsors Schwalbe, Sports2, Qoleum and St Kilda Cycles. Regardless of whether I race this weekend or not, I'll have a post with Sonoko's photos and the Bruges beer festival next week. Right now its time to shave off this ridiculous 'mo' and get a haircut. I've also had a couple of interviews following the race, and I wrote a journal for CX Magazine. This was an interview for a German CX website. You did a great job in Koksijde, don't be dissapointend. It's our sport. Maybe you have more luck next year, when the world championship is in USA. It will be a different race, and I think it will fit you better then the race on the beach it was here. I agree with Bart. You've done something fantastic and the result doesn't matter. Drink Beer AND race at Lille! It's been fun following your adventures.